While upstream deal activity has been low in general in Canada since the start of 2016, TSX and TSX-V listed junior companies have been common takeover targets during the price downturn and very active in selling assets. A junior oil and gas producer is a company that produces between 1,000 and 10,000 boe/d. In total, according to new analysis using the CanOils M&A database, between the start of January 2015 and the end of February 2016, there were 35 deals involving a publicly-named junior oil and gas producer in Canada as the selling entity (see note 1). The total value of these deals was just over Cdn$2 billion and the deals that included producing assets ranged from a cost of Cdn$12,000 to over Cdn$100,000 per flowing barrel of oil equivalent. A more data-focused recap of the biggest Canadian junior divestitures in 2015 and 2016 forms part of CanOils’ latest monthly M&A review for February 2016. Murphy Oil Corp. (NYSE:MUR) and Athabasca Oil Corp. (TSX:ATH) entered into a joint venture agreement in January 2016 targeting the Duvernay and Montney shale plays of Alberta. Murphy will pay Cdn$475 million (Cdn$250 million in cash, Cdn$225 million by way of cost carries) to earn a 70% operated interest in Athabasca Oil’s Duvernay lands in the Greater Kaybob area and a 30% non-operated interest in Montney lands in the Greater Placid area. Source: CanOils Assets. The yellow blocks outside of the red polygon are the Duvernay, Greater Kaybob lands involved in the deal, the blocks inside the red polygon are the Montney lands. Poland’s PKN Orlen SA, through its subsidiary ORLEN Upstream Canada Ltd., took another step to increase its foothold in the Canadian E&P space by completing its Cdn$356 million acquisition, including debt, of Kicking Horse Energy Inc. (formerly TSX-V:KCK). The deal was first announced in October 2015 and closed at the start of December. The acquisition increased the Polish refiner’s Canadian subsidiary’s production in Canada to around 11,000 boe/d and pushed its 2P reserves up to nearly 80 mmboe. This is the company’s third major acquisition in Canada since 2013. Privately held Aspenleaf Energy Ltd. acquired Alberta Deep Basin and Kaybob producer Arcan Resources Ltd. (formerly TSX-V:ARN) in a Cdn$300 million deal including debt assumption that closed in June 2015. The cash paid per share in the non-debt portion of the transaction represented a 100% premium to the TSX-V listed company’s share price the day before the acquisition was announced in late April. In February’s biggest deal, a private equity fund raised and advised by ARC Financial Corp. agreed to acquire all the issued and outstanding shares of Boulder Energy Ltd. (TSX:BXO). This Cdn$268 million deal is featured in detail in CanOils’ February M&A review, which can be downloaded here. 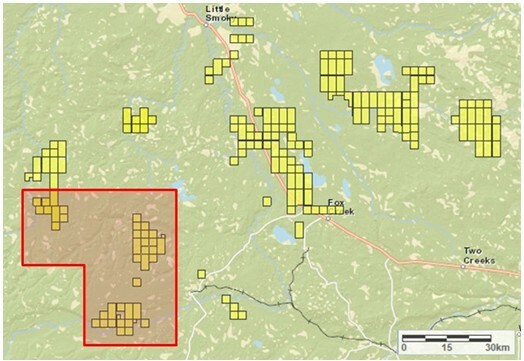 In a complex reorganisation arrangement first announced in February 2015, Pinecrest Energy Inc. (formerly TSX-V:PRY) sold 100% of its assets to Virginia Hills Oil Corp. and Cardinal Energy Ltd. Virginia Hills assumed 90% of Pinecrest’s assets for around Cdn$90 million of stock and assumed debt at a cost of around Cdn$59,000 per flowing boe for the 1,530 boe/d included in this part of the process. Virginia Hills (TSX-V:VHO) continued on as the resultant public company. The remaining 10% of Pinecrest’s assets as well as all of Pinecrest’s issued and outstanding stock was then acquired by Cardinal Energy for Cdn$23.5 million in cash. The arrangement completed in April 2015. This trend of the junior TSX and TSX-V companies being active sellers in the M&A market is set to continue throughout 2016. As lower commodity prices have endured, more and more of Canada’s smaller producers have fallen into difficulty. February 2016, for example, saw the appointed receiver and manager of Spyglass Resources Ltd. (TSX:SGL) announce this month that they are seeking buyers for the company’s assets, after it entered receivership in November 2015. This, as well as all new Canadian asset listings in the last month, also forms a major component of CanOils’ M&A Review for February 2016. 1) There may have been many more deals involving a selling junior oil and gas producer in Canada, but it is not uncommon for either the acquiring or the selling party in a transaction to remain anonymous. 2) The production level listed next to each selling company’s name is the production that was most recently reported by that company in quarterly reports at the time of the transaction being announced. 3) All data and analysis here was created using the CanOils M&A database.